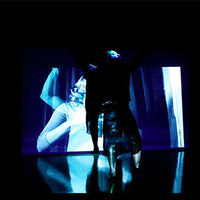 Kalup Linzy is a video and performance artist based in Brooklyn, New York, and Florida. Born in Clermont, Florida, and raised in Stuckey, Florida. Linzy received his MFA from the University of South Florida. He also attended the Skowhegan School of Painting and Sculpture. Linzy has been the recipient of numerous awards including a grant from the Louis Comfort Tiffany Foundation, the John Simon Guggenheim Memorial Foundation fellowship, Creative Capital Foundation grant, a Jerome Foundation Fellowship, an Art Matters Grant, the Headlands Center for the Arts Alumni Awards Residency, and a New York Foundation for the Arts Fellowship in Film and Video. Linzy has participated in many artist residencies as a faculty or participant; they include Art Omi, the MacDowell Colony, Ox-Bow, Vermont Studio Center, Headlands Center for Arts, Marie Walsh Sharpe, the Fountainhead, and Tempus Projects. Linzy's best-known work is a series of politically charged videos that satirize the conventions of the television soap opera. His work has been included in the exhibitions Frequency at the Studio Museum in Harlem, Prospect.1 New Orleans, 30 Americans, Rubell Family Collection, MoMA PS1 Greater New York, At Home/Not At Home: Works from the Collection of Martin and Rebecca Eisenberg, Hessel Museum of Art, Bard College. His work is in the public collections at the Studio Museum in Harlem, Whitney Museum of Art, Museum of Modern Art, the Metropolitan Museum of Art, and the Birmingham Museum of Art. In summer 2010, Linzy appeared on the long running ABC soap opera "General Hospital," alongside James Franco, in a story line that incorporated performance art. He has released several musical projects. Recently, he has been featured in exhibitions at the Whitney Museum of Art, the USF CAM in Tampa, Florida, the 2016 Sundance Film Festival, the Bob Rauschenberg Gallery, and the Albany Museum of Art. Linzy is represented by David Castillo Gallery in Miami Beach and the Breeder Gallery in Athens, Greece, and he is on the board of the Florida Museum of Photographic Arts in Tampa. Currently, he is a 2019 Tulsa Artist Fellow.